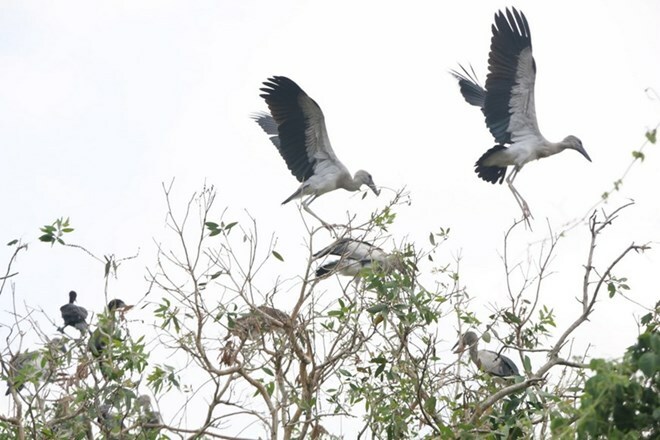 Bac Lieu (VNA) – About 200 Asian openbills, an endangered species listed in Vietnam’s Red Book, have resided in Bac Lieu Bird Sanctuary, the Mekong Delta province of Bac Lieu, since the beginning of 2019. In Vietnam, the species is only found in small numbers in some places in the southwest. Habitat loss in recent years has forced Asian openbills to migrate to other areas. The sanctuary’s management board said patrols have been stepped up to prevent activities threatening birds’ habitat and food seeking areas. Additionally, forest management and conservation efforts have helped create a safe environment for various bird species, including rare ones, to live and breed. The management board has also worked with local authorities to encourage local residents to get involved in forest protection, it added.